Buy Billy Fore a Coffee. ko-fi.com/billyfore - Ko-fi ❤️ Where creators get paid by fans, with a 'Buy Me a Coffee' button. I'm Billy Fore! 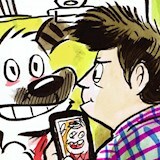 I draw a comic strip called "Marco and Marty" and am an illustrator living in Urbana, Illinois. My interests include crosswords, theatre, comics, poetry, and the color taupe. Secured Payments. Support goes to Billy Fore's account. Upgrade Billy Fore to a yearly Gold Membership with a one-time payment.